American spacecraft systems testing followed by increasingly complex flight tests and ultimately astronauts flying orbital flights will pave the way to operational missions during the next few years to the International Space Station. Those were the plans laid out Monday by NASA’s Commercial Crew Program officials and partners as they focus on developing safe, reliable and cost-effective spacecraft and systems that will take astronauts to the station from American launch complexes. According to Boeing, the company’s schedule calls for a pad abort test in February 2017, followed by an uncrewed flight test in April 2017, then a flight with a Boeing test pilot and a NASA astronaut in July 2017. SpaceX said they anticipate a pad abort test in about a month, then an in-flight abort test later this year as part of its previous development phase. An uncrewed flight test is planned for late 2016 and a crewed flight test in early 2017. 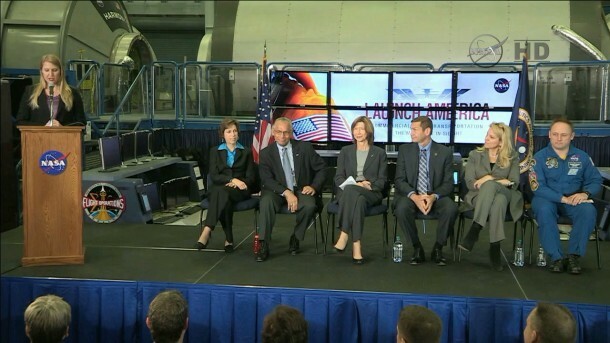 Speaking for the first time together since the awarding of the final development and certification contracts, officials from NASA’s Commercial Crew Program, Boeing and SpaceX revealed some of the details of their plans to cross the chasm from spacecraft and launch system design to flight tests, certification and operational missions to the station. Boeing and SpaceX were selected in September 2014 to finalize their respective CST-100 and Crew Dragon spacecraft along with the rockets that will lift them into orbit and all of the ground and mission operations networks essential for safe flights. Both companies have worked with NASA’s Commercial Crew Program throughout multiple development phases, continuing to advance their designs before being chosen to complete their systems, reach certification and then fly astronauts to the station. The goal of NASA’s effort is to provide an American launch vehicle and spacecraft capable of safely carrying astronauts to the station. Unlike other NASA spacecraft, though, this new generation of human-rated vehicles will be designed, built, operated and owned by the companies themselves, not NASA. NASA will buy space transportation services from the companies for astronauts and powered cargo. It will be an arrangement like the one the agency uses already with the Commercial Resupply Services initiative that uses privately developed and operated rockets and spacecraft to deliver critical cargo to the station. The new spacecraft will allow the station’s crew to expand to seven astronauts and cosmonauts, which means twice as much time for research aboard the one-of-a-kind scientific platform – 80 hours a week instead of the current 40. Also, the handoff of flight to low-Earth orbit will permit NASA to pursue the challenges of deep space exploration and the journey to Mars with the Space Launch System rocket and Orion spacecraft. Boeing and SpaceX each proposed a set of objectives and milestones that suits their development, testing and flight plans. NASA’s role is to evaluate progress and make sure it meets stringent safety requirements, including a safe launch abort system built in to provide astronauts a means of escaping a potentially catastrophic situation. The agency placed a premium on giving providers the freedom to come up with innovations in design, manufacturing and testing. Ultimately, NASA expects to have two separate spacecraft and launch systems it can turn to for flights of crew to the station and low-Earth orbit. The companies also can provide space transportation services to private citizens, companies and institutions in what could become a new industry for the American aerospace sector. The STS-135 mission, the final flight of the space shuttle, delivered an American flag to the station as a prize for the first Commercial Crew astronauts to visit the orbiting laboratory. A second flag will be taken to the station and brought back as a symbol of success as well. “When we have both of these flags on the ground with their crews safely returned, we’ll all be winners,” Lueders said. Boeing and SpaceX anticipate using facilities at Kennedy and the adjacent Cape Canaveral Air Force Station for aspects of processing and launch. Boeing’s CST-100 program will be based at Kennedy with the spacecraft being assembled inside one of the hangars formerly used to process space shuttles. Riding atop a United Launch Alliance Atlas V rocket, the CST-100 will launch from Cape Canaveral’s Space Launch Complex 41. A tower designed for the needs of astronauts and support staff is already under construction at SLC-41. The work comes at a time when NASA is marking significant progress in a number of areas. For instance, the space station has housed crew members for 14 straight years and a NASA astronaut and Russian cosmonaut are getting ready for a yearlong residency there. There also is a NASA spacecraft already in development to carry astronauts on deep space missions along with a massive new rocket for it in manufacturing. Not to mention the New Horizons probe closing in on Pluto. SpaceX leased Launch Complex 39A at Kennedy and will build a facility at the base of the pad that will be used for processing its Falcon 9 rockets and Crew Dragon spacecraft for launch. The company launches cargo-carrying Dragons and other uncrewed spacecraft from Space Launch Complex 40 at Cape Canaveral. “We understand the incredible responsibility we’ve been given to carry crew,” said Gwynne Shotwell, president of SpaceX. Speaking in front of the agency’s astronaut corps, the panelists offered an appealing vision of space travel including long-term spaceflight research and deep space missions. The flights to the station are vital to NASA’s goals, Bolden reiterated, and as the agency sets its eyes firmly on the Red Planet.